diglloyd blog: 2.5K or 4K or 5K Display for Image Editing and Viewing? In yesterday’s Too-High Pixel Density on 5K and 8K Displays Impedes Image Assessment essay, I discussed the challenges of evaluating and editing images on a display with extreme pixel density. Today, I want to up-level that discussion and summarize what I see as the pros and cons of a 4K or 5K or 8K display versus a 2K or 2.5K display. My workhorse display, the 2.5K 30" NEC PA302W. True internal calibration and tracking, true neutral grayscale rendition (no magenta tint as with many LED displays), outstanding color gamut, 2560 X 1600 resolution for superior vertical working space. Similar, but smaller the PA242W and PA272W. The 32" NEC PA322UHD 4K display. True internal calibration and tracking, wide color gamut, 3840 X 2160 resolution for superior vertical working space, moderate pixel density due to the 32" form factor. The viewing enjoyment champion: the late 2015 Apple iMac 5K. The best way to view images, bar none (possibly the LG 5K is as good, or the Dell 8K). For 2016 MacBook Pro users: the LG 5K. Considerations are the same as for the iMac 5K. If and when it proves out on the 2016 MacBook Pro (only, at this time), the Dell UltraSharp 32 Ultra HD 8K. Eizo is excellent, but very expensive (2.5K, 4K). I do not recommend TV-size displays for general work due to a basic ergonomic problem: anything past about 34 inches becomes an uncomfortable head-swivel to see the display properly. Plus the greater viewing distance required simply recreates the pixel density issue anew. Plus the pixel density becomes too coarse and most TVs do a poor job as a computer display. If you’re buying a display for viewing pleasure, go straight to 5K (or 8K)—a no brainer. High megapixels for outstanding realistic looking images; very high viewing pleasure. 8.3 megapixels on 4K, 14.2 megapixels on 5K, 33.2 megapixels on 8K. Like looking at a 'chrome' (4K is just a bit weak here, 5K is much better). Particularly on the iMac 5K and LG 5K: outstanding image contrast that delivers rich black blacks, and white whites. Extreme pixel density makes image evaluation much more challenging. A 4K display in 32" size is acceptable, but represents an inflection point on pixel density. Absent or unproven color calibration with many solutions (Apple, Dell, LG all fall short). Solutions like Eizo 4K are an exception. Aspect ratio of 1.78:1 is unfriendly to 3:2 or 4:3 images. For 4K video, a 4K display is all but mandatory. 5K is even better in some ways, since it allows room for tools/palettes. Just a heck of a lot nicer to look at for everything. Pixel density on a 32" 4K display may be acceptable, but pixel density issues come to bear with 4K at 27" or 24". Professionals who evaluate images or edit fine details or who require superb color gamut and color tracking over time should consider the points above and below carefully; these are “bread and butter” considerations that may outweigh the beauty considerations of 4K. The right answer for any particular workflow might not be apparent until after buying, but thinking it over in advance increases the odds of making the right choice. 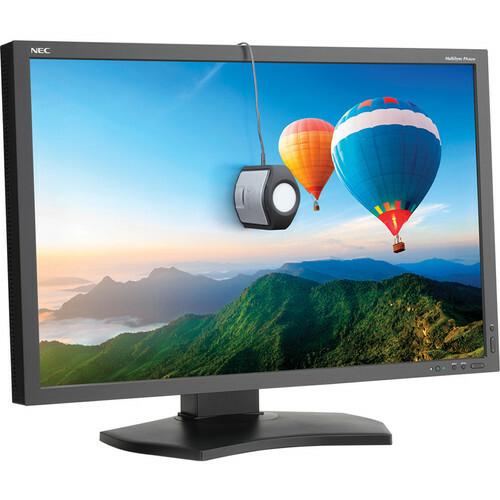 Proven color calibration (NEC, Eizo) with wide to exceptional gamut. Low pixel density allows much more eye-friendly image evaluation and detail work. Generally a better choice for print matching (glossy ultra high contrast displays like the iMac 5K do not translate quite the same). NEC PA302W in particular: the 2560 X 1600 resolution (aspect ratio 1.6:1) is a better fit for 3:2 or 4:3 images. Absent or unproven color calibration with many solutions (Apple, Dell, LG all fall short). At present, I run the NEC PA302W (101 dpi) as my primary display with the 4K NEC PA322UHD (140 dpi) as a secondary display. I would prefer a secondary display that is 5K or 8K, but this is not viable on the Mac Pro (I’m not going to lose two ports to dual cables to a 5K display)—I’ll have to wait for some future Mac. At this point, I’m hoping to see a new Mac Pro that supports 8K, at which point I will decide if the benefits of 8K outweigh the evaluation and editing hassles. An iMac 8K would win me over, since I could run the PA302W as a 2nd display for calibrated color accuracy and ease of evaluating image sharpness; the 8K display would be for sheer viewing pleasure. A compromise that I would find ideal would be a 5K display in a 34" form factor (172 dpi), thus large enough to have a pixel density that is high but (maybe) still viable for image evaluation.. But that does not exist and my existing machines would require dual Thunderbolt cables for Multi Stream Transport to make that work—unacceptable and flaky as tested. I suspect that I ultimately will end up with an 8K display—large I hope—and I will just have to deal with the pixel density issue by zooming in and/or cropping for evaluation.